At Sign World, we offer a wide variety of commercial signage mediums that can fit any budget or business niche. One of our more popular commercial sign options is the banner. Banners have been used since the Feudal era, where they were considered to be an indicator of regal nobility. Since then, the royal association has dampened a bit, but banners are still an excellent choice for business owners seeking a cost-effective form of advertising. Modern banner technology has come a long way, too. Gone are the days where squires and yeomen were forced to lug around large, cumbersome banners for their lords. Today, retractable banners (known commonly as “pop up banners”) are the perfect solution for your on-the-go advertising needs. Easy to carry and simple to set up, retractable banners offer users the perfect advertising solution in a wide number of settings. Today, the Sign World team discusses 3 common uses for retractable banners. Read on to learn how you can make your business stand out in many different settings! In the business world, tradeshows are kind of like the Colosseum where rival business owners enter and engage in a battle royal for professional contacts and clients. Though business owners may be civil and smiling, the reality is that trade shows are highly competitive, and retractable banners can give you the competitive edge. In a trade show setting, retractable banners are an excellent visual tool. You can use them to captivate passersby, quickly explain products or services, and build brand recognition by displaying company logos and slogans. 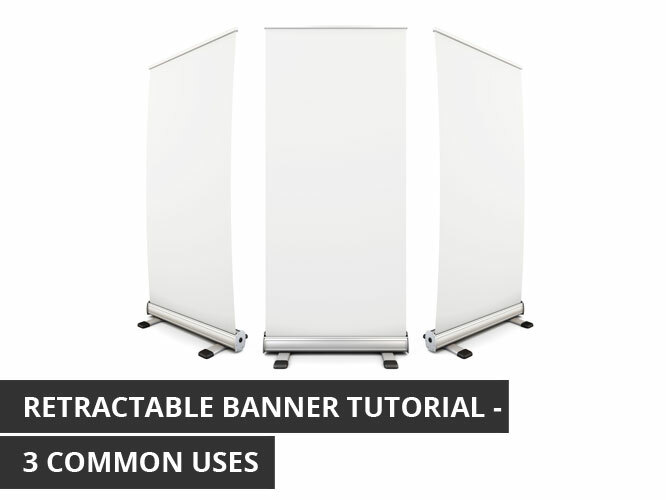 To optimize the impact of your retractable banner, place it in front of your booth. Perhaps most importantly, angle the front of the banner to face the flow of traffic. Too many business owners make the mistake of turning it perpendicular to the foot traffic “lane” – or worse, within the confines of their booth – which only gives strollers a few seconds with the message in view. By angling it towards the flow of traffic, you give them full view of your banner’s contents from across the conference center! Speaking at conferences is stressful enough without having to worry about a complicated setup. And yet, speakers always benefit from visual aids. If you want the benefits of the visual medium without the pain of setup, retractable banners are an excellent option. They set up in seconds, letting you display pictures, add further context to a subject, or emphasize key points, figures, and dates. Small business owners understand the importance of advertising within their communities, and retractable banners get the job done well. Because they’re so inexpensive and portable, they are the perfect advertising tool for the start-up business owner. Your banner can showcase your company’s accomplishments within the community, highlight how your business benefits the locals, and offer promotional information. In our era of mobile phone omni-connectivity, be sure to include a website address and social media account for passing millennials to check out, then watch your analytic metrics closely to measure the effectiveness of your sign’s design, placement, and message. Visit https://signworld.org today for more signage best practices, and book a consultation with one of our concept development experts for help with sign design!